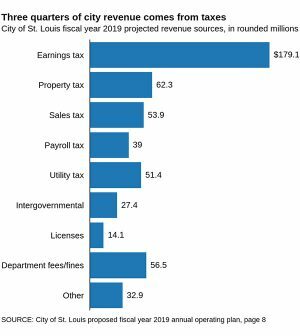 From St. Louis Post-Dispatch: The city’s spending plan for the next fiscal year has a $10 million hole. Sales and earnings tax revenues are flat or lagging so far this year, with overall revenue expected to be down by roughly 5 percent from estimates. Most new revenue is designated for police and firefighter raises or transit improvements. City leaders also stress the need to save for a rainy day. Budget Director Paul Payne patched the hole in the draft 2019 budget that he sent to elected officials, but now, the tug-of-war begins over spending priorities. Already, the Board of Estimate and Apportionment has restored $800,000 for neighborhood stabilization officers. Aldermen will have to find other places to make up that money. As the aldermen begin their debate, some say too much money is being spent on policing, at the expense of human and social services. At the same time, Mayor Lyda Krewson hopes to protect spending priorities, including funding for affordable housing and neighborhood improvements.